On the weekend of August 19-20, 2006, I spent another weekend in Mexico on my way back home from a work-related trip. My good friend Ruben Resendiz could not join me so I rented a car, spent Friday night in Mexico City, and headed out on my own early on Saturday morning. 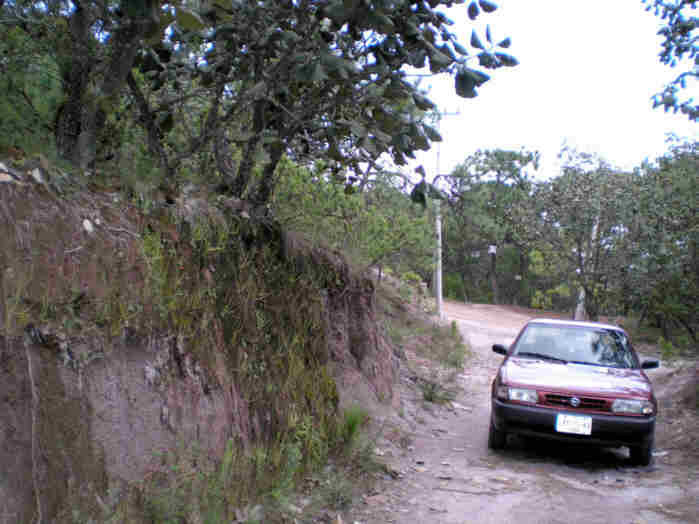 I drove to Taxco in Guerrero state to visit Cerro El Huixteco. This is the only area in Mexico where I’ve found 3 species of Pinguicula: P.heterophylla, P.moranensis, and P.parvifolia in close proximity. It is also one of the 3 places where I’ve seen Utricularia in Mexico (U.livida). 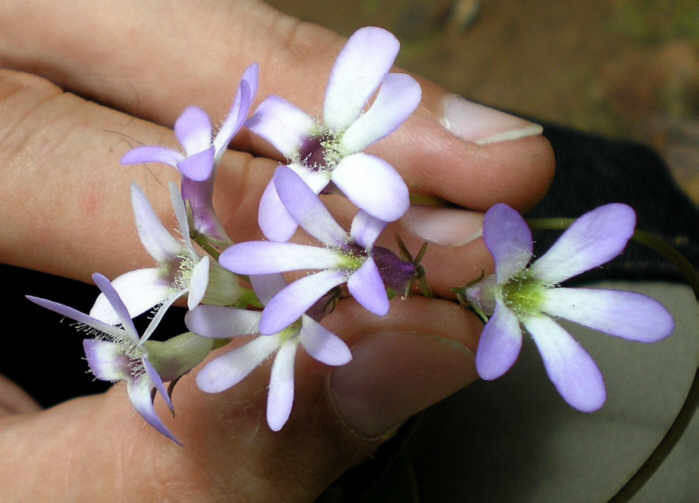 Fellow CPers Forbes Conrad & Noah Elhardt had visited El Huixteco around 2 months earlier and found P.heterophylla and P.parvifolia at what appeared to be the peak of their flowering season. They’d also found what appeared to be a hybrid between these two taxa. I was hoping I could still find at least a few individuals of P.heterophylla and P.parvifolia in flower, not to mention the hybrid. 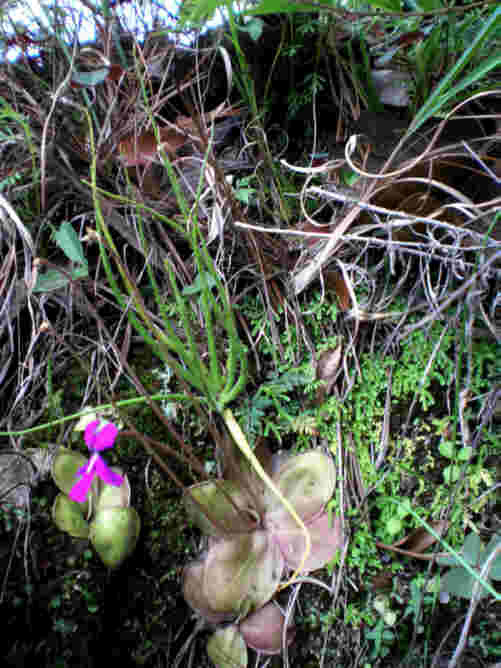 Orchid growing in Cerro El Huixteco, Taxco. The habitat of P. heterophylla in El Huixteco, Taxco. 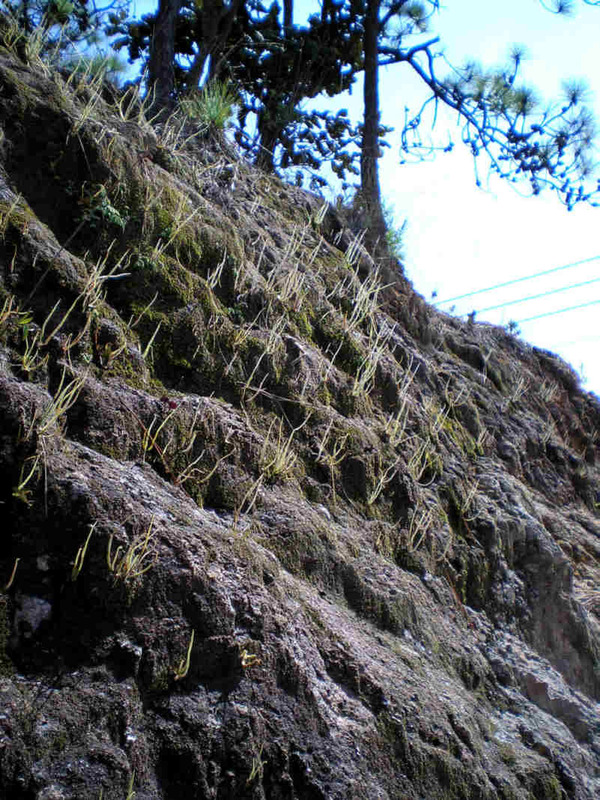 Thousands P. heterophylla in El Huixteco, Taxco. 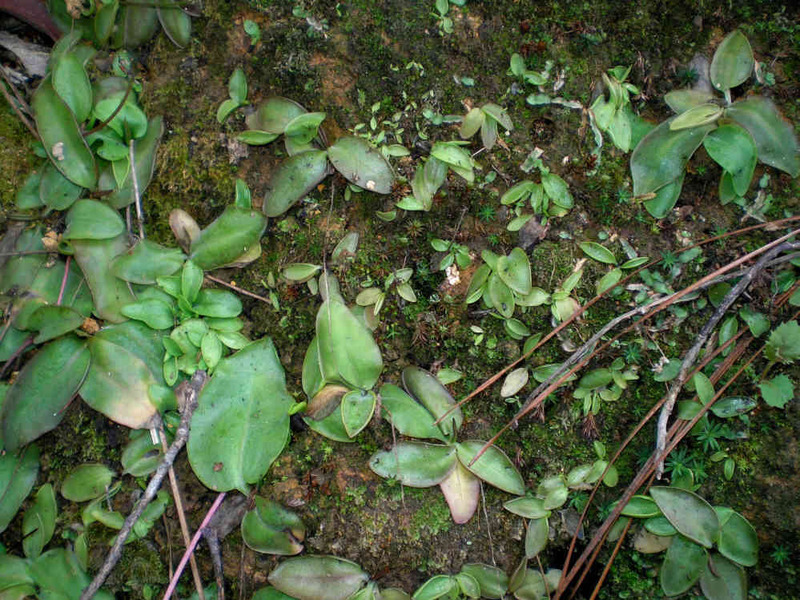 P. heterophylla in El Huixteco, Taxco. Close up picture of the rosette of P. heterophylla. 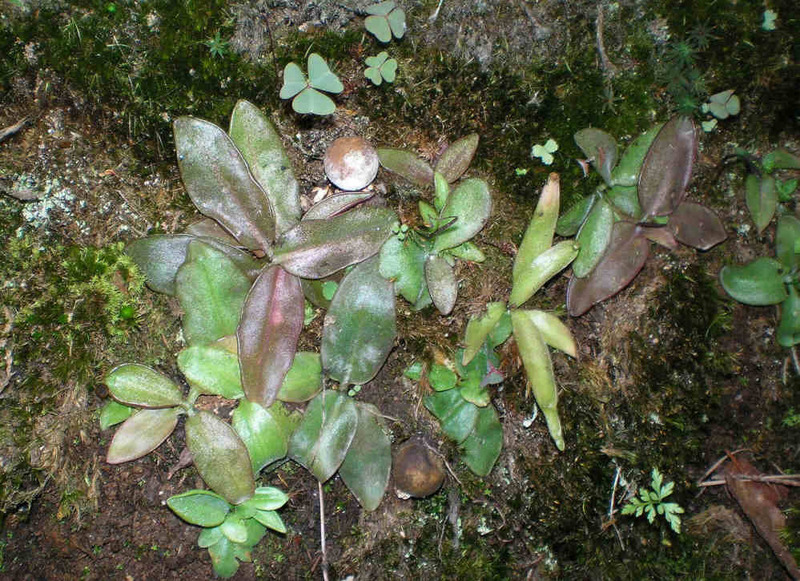 P. heterophylla and P. moranensis growing together in El Huixteco, Taxco. No hybrids were found between these two species. Various P. parvifolia in habitat in El Huixteco, Taxco. P. parvifolia in habitat in El Huixteco, Taxco. 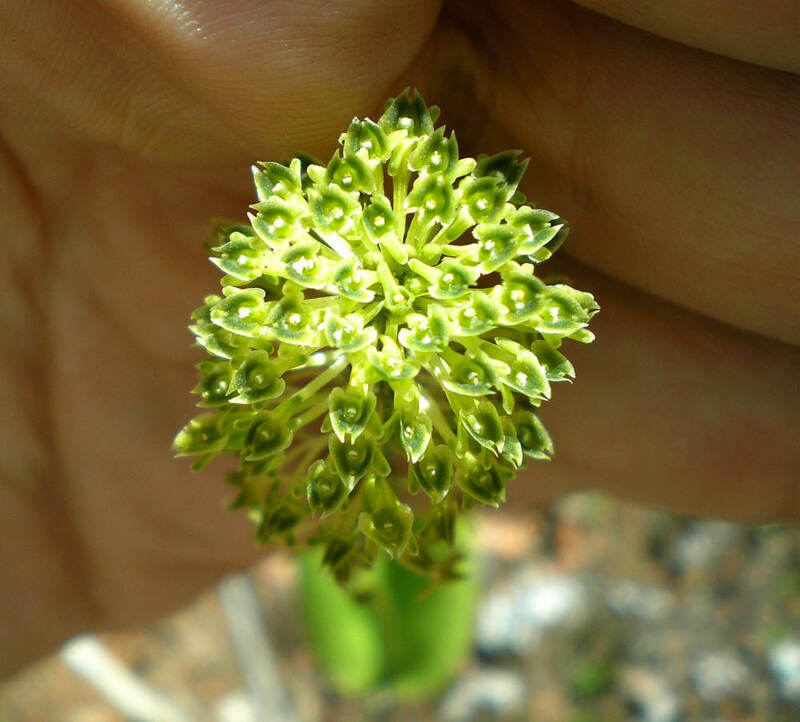 Close up of a flower and seeds on maturation on a P. parvifolia. Collection of flowers of P. parvifolia from habitat in El Huixteco, Taxco. 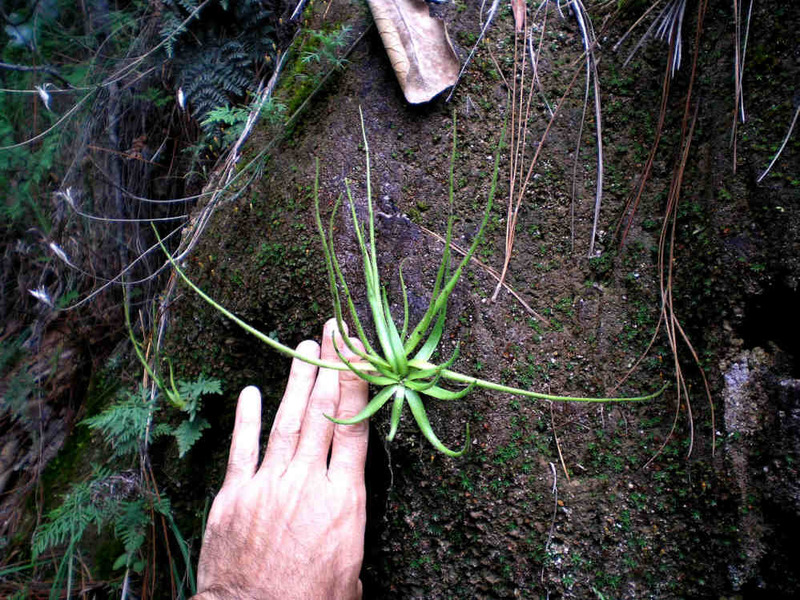 P. parvifolia and the hybrid of this species with P. heterophylla in El Huixteco, Taxco. 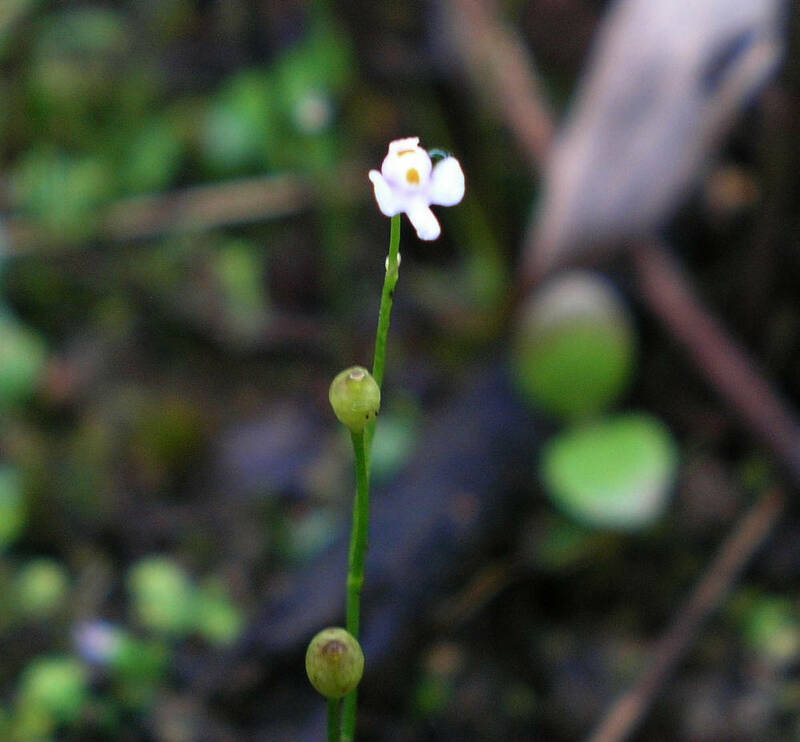 To my deception, not a single flower was left on P.heterophylla. 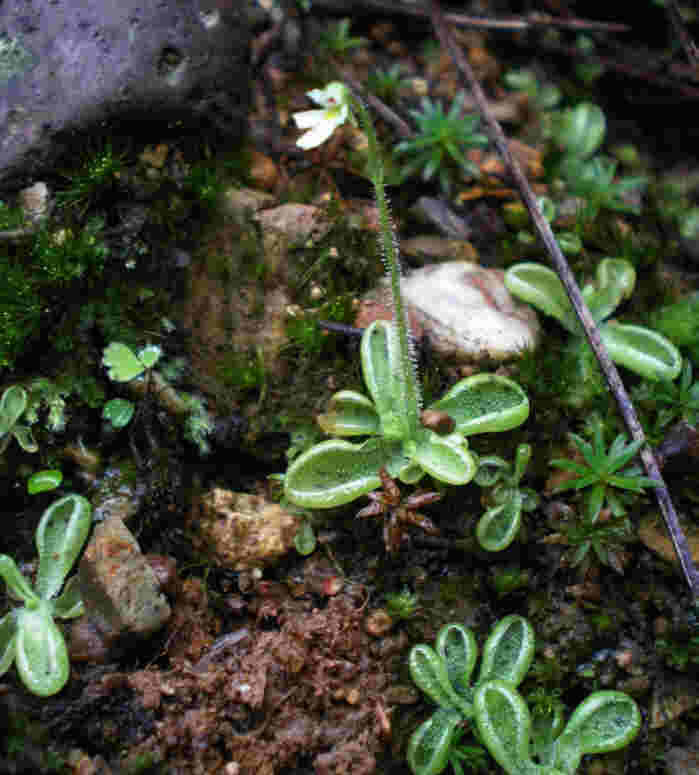 It is nonetheless a beautiful and unusual Pinguicula with its long slender leaves, and I thoroughly enjoyed myself photographing hundreds and thousands of P.heterophylla growing along sunny slopes by the roadside facing east and south. I was even briefly distracted from CPs (I admit it!) by a very unusual orchid with an inflorescence packed with numerous green flowers. 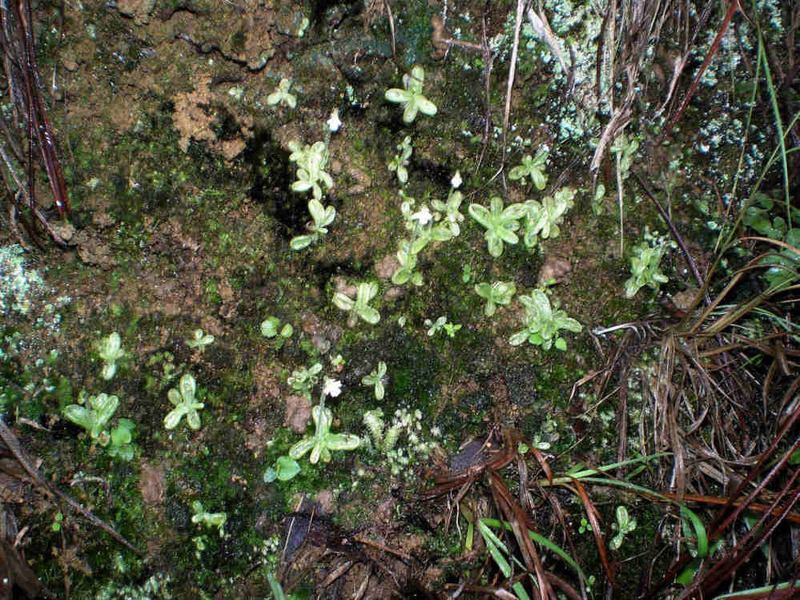 Although countless P.heterophylla were observed at El Huixteco, only 2-3 live scapes with fruit were found. It was obviously WAY past flowering season for P.heterophylla. I didn’t see any U.livida, which appeared not to have begun flowering yet – although I admit I didn’t really search for it. I saw plenty of P.moranensis along the road climbing the mountain, many of which bearing beautiful purple-pink flowers. I even found a small hidden corner I’d missed on previous trips where P.heterophylla and P.moranensis grew side-by-side. However, no hybrids were found. I’d completely forgotten where P.parvifolia grew on El Huixteco and had to get out my cell phone to call Ruben for tips. I finally did find thousands of P.parvifolia growing in dense mats along a semi-shaded roadside (almost a trailside) facing north in open forests. 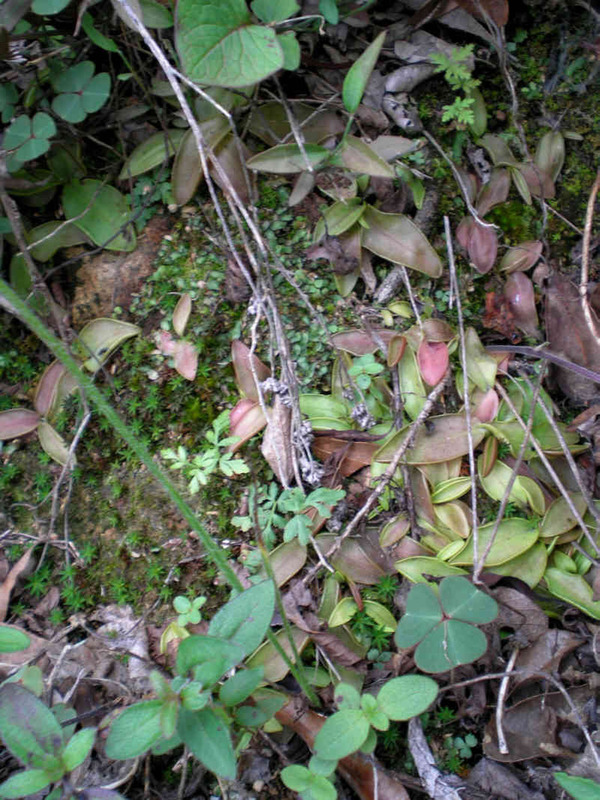 Plants were very variable in leaf shape, size and color. 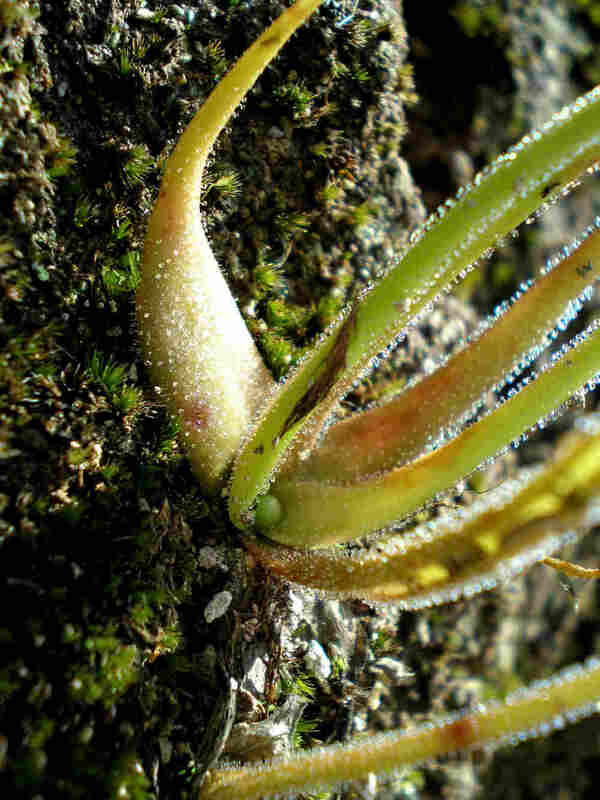 I was actually very surprised to notice how similar the rosettes of P.parvifolia are to those of P.orchidioides (narrow leaves with thin & hairy petioles). I was fortunate to still catch several plants in bloom, although scapes with fruit were much more numerous. 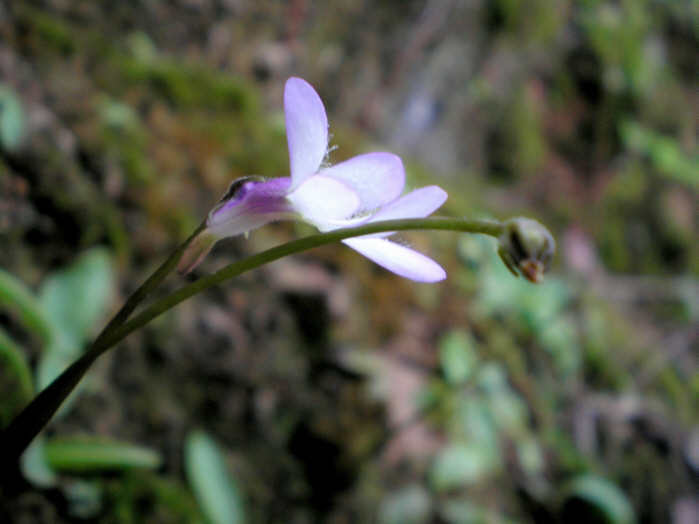 The petal lobes were either a uniform light-lilac or darker lilac on the petal tips. The corolla tube entrance had a yellow-green patch at the bottom and was colored a darker lilac-purple both on the inside and outside, while the spur was green. I payed close attention to the leaf shape of P.parvifolia, trying to spot hybrids with P.heterophylla (which I saw growing in a small patch of nearby). I only saw one plant which resembled a hybrid, but there were no flowers to help prove this possibility. I later discovered that Forbes & Noah found the hybrids at a different spot, much further down the road where P.heterophylla first appears around 2100m altitude. Ruben & I didn’t see P.parvifolia here on previous trips, probably because we were driving and not walking like Noah & Forbes (plus it wasn’t flowering season when we visited). At this lower site, P.parvifolia and P.heterophylla grow together according to Noah & Forbes. From Taxco I headed northwest to Toluca, where I spent the night. 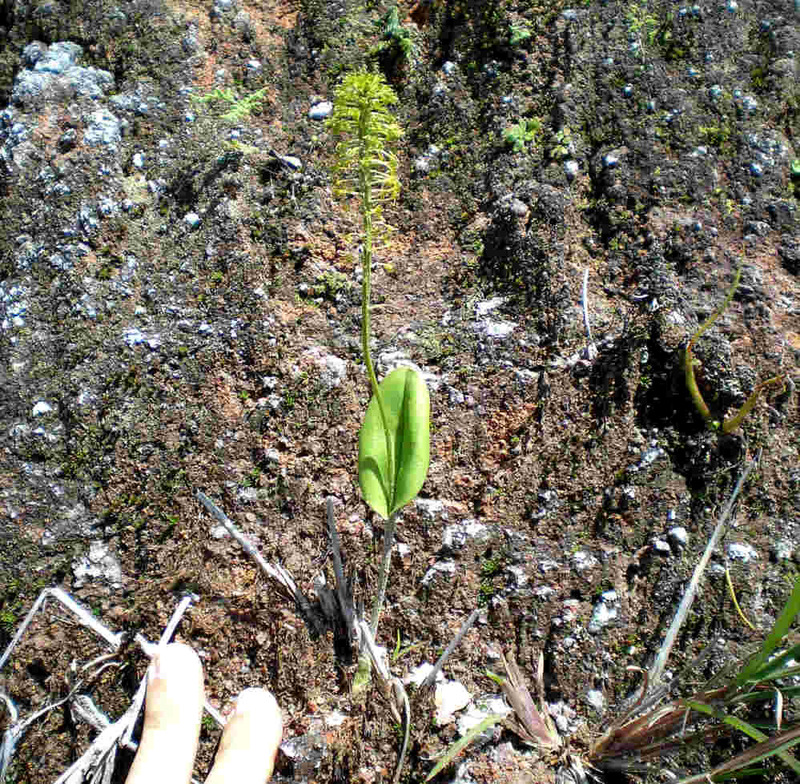 Along the way I visited some ancient ruins and saw more P.moranensis by a roadside. On Sunday morning I headed towards the town of Tejupilco, in southwestern Mexico state, to a site where I’d discovered P.crenatiloba nearly 3 years ago, growing on humid vertical banks by a river. 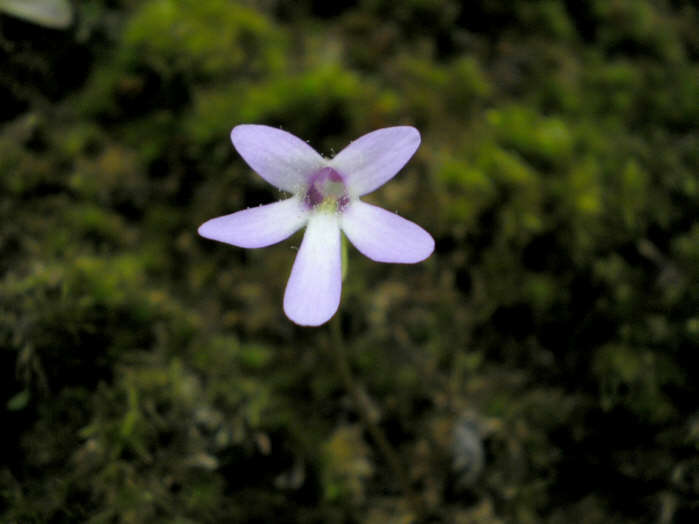 I was not sure if the annual P.crenatiloba would be up and growing so early in the wet season – but I wasn’t really going there to see this nor any other Pinguicula species. 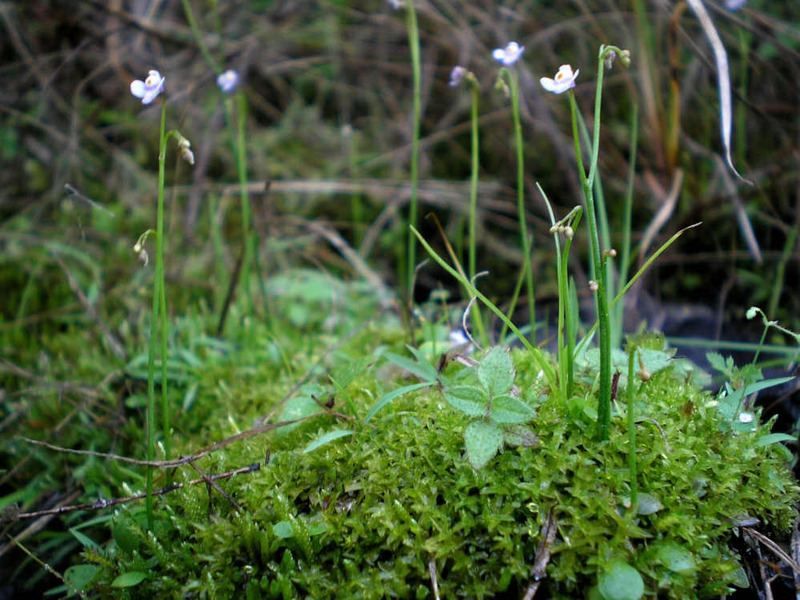 I wanted to find an Utricularia, maybe the rarest Utricularia species in the world: U.hintonii. 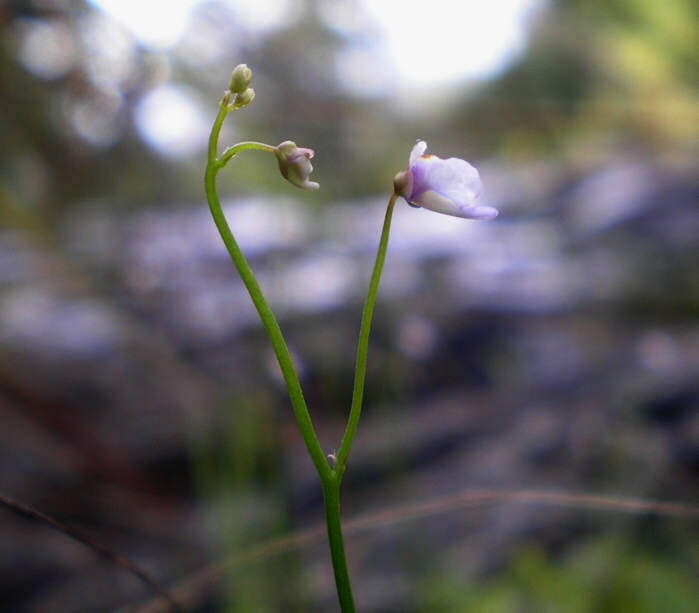 Utricularia hintonii was described by Peter Taylor only in 1986, based on a single specimen collected in June 1933 near Nanchititla, which is a bit further south from Tejupilco. The color of the flowers was not recorded and the fruit were said to be unique in that they curved inwards towards the scape. 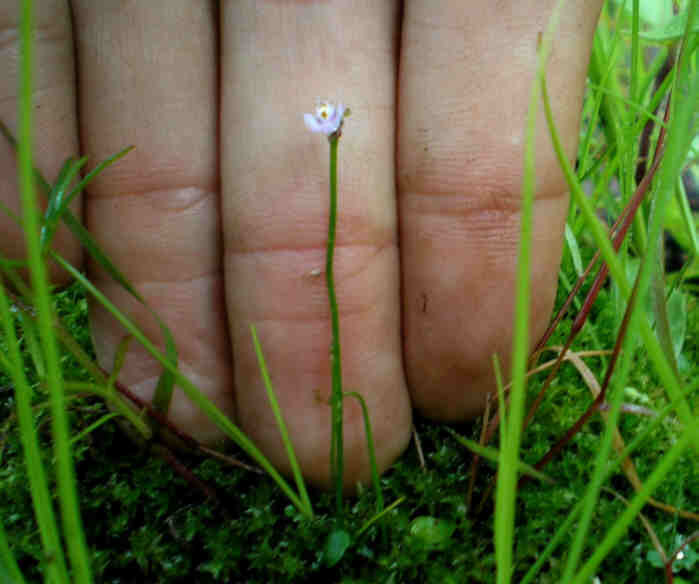 The inflorescences were up to 10cm high and the leaves spatulate, less than a centimeter in length. 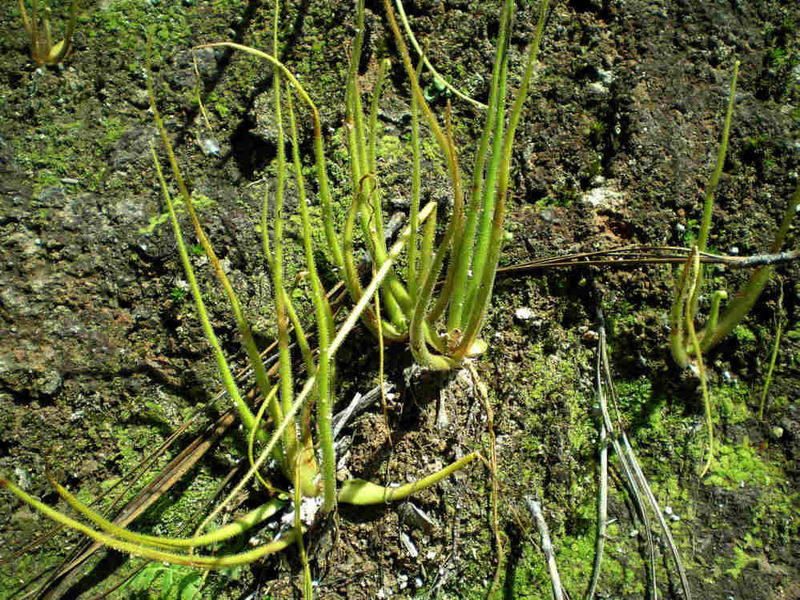 While studying P.crenatiloba in late 2003 near Tejupilco (see Postcard #6), I had accidentally stumbled upon a scape of U.hintonii growing among grasses along the river margin. The flower was white with two mustard-colored spots on the lower lip, one above the other. 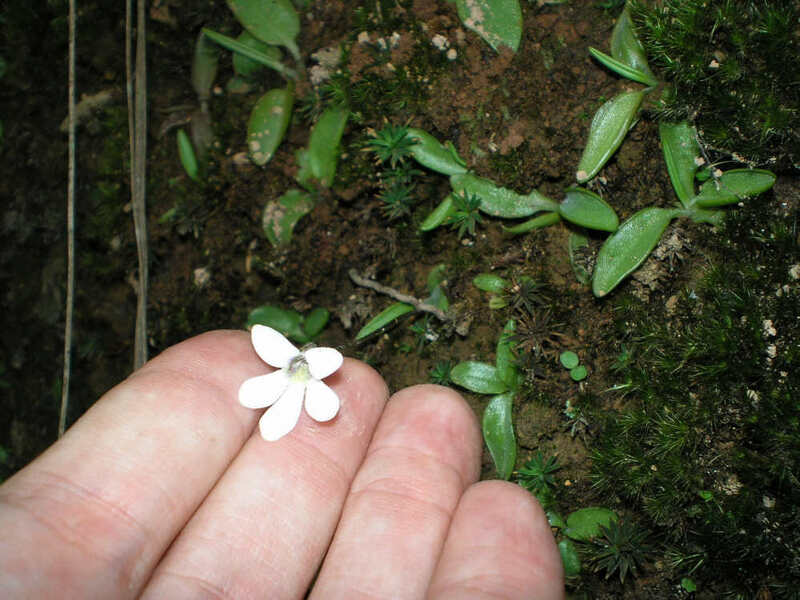 At the time I did not realize it was U.hintonii – caught up as I was with the discovery of P.crenatiloba – and mistook it for a small white form of U.amethystina, which I commonly see while hiking in Brazil. Only a few months later did I notice the importance of that single flower scape, finally realizing that after 70 years of obscurity I’d actually rediscovered the elusive U.hintonii! I was very anxious to revisit Tejupilco and hopefully find more U.hintonii, in order to study it better than that single scape I’d found late in the growing season of 2003. Upon arriving at the site, I quickly found numerous P.crenatiloba growing on the same wet vertical banks above the river and was surprised to find many plants already in flower. 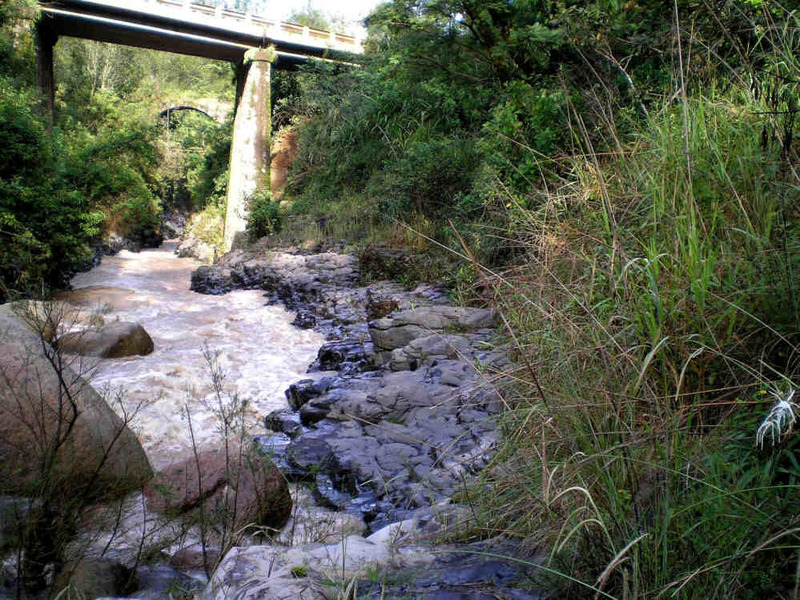 The habitat of P. crenatiloba growing near the river. P. crenatiloba growing on humid vertical banks by the river. Young flower scapes on these tiny P. crenatiloba rosettes. I searched the river margins for the short scapes with small white flowers of U.hintonii, but found nothing. 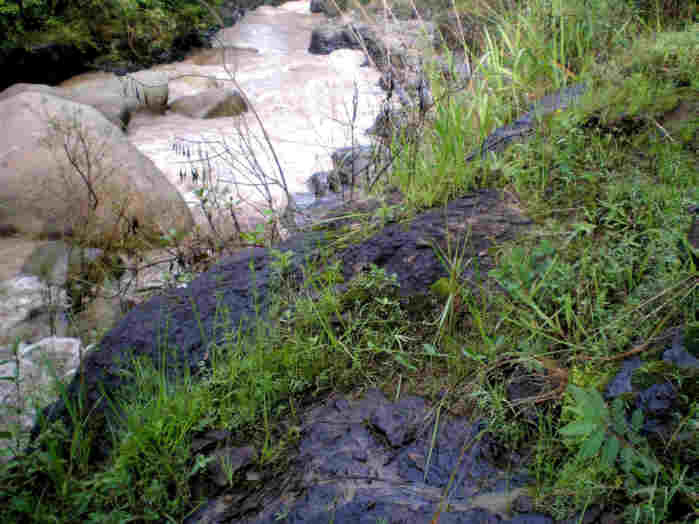 The river had visibly overflown its margins recently, as indicated by the vegetation leaning flat on the ground facing downstream and accumulated pockets of organic debris. It would be nearly impossible to find an erect scape of such a fragile plant as U.hintonii among the flattened vegetation. 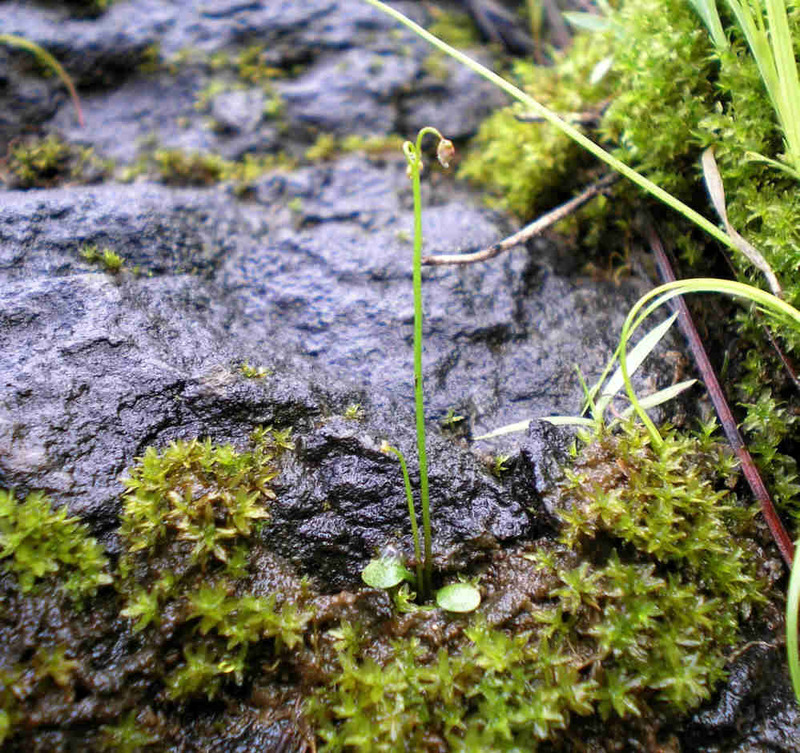 And sure enough, there I found U.hintonii in wet mossy islands of vegetation among the rocks! They were very abundant locally, but the flowers were not white. Instead they were mostly lilac with white on the palate around the two mustard spots on the lower lip. I guess the one I found in 2003 was a late season mutant. 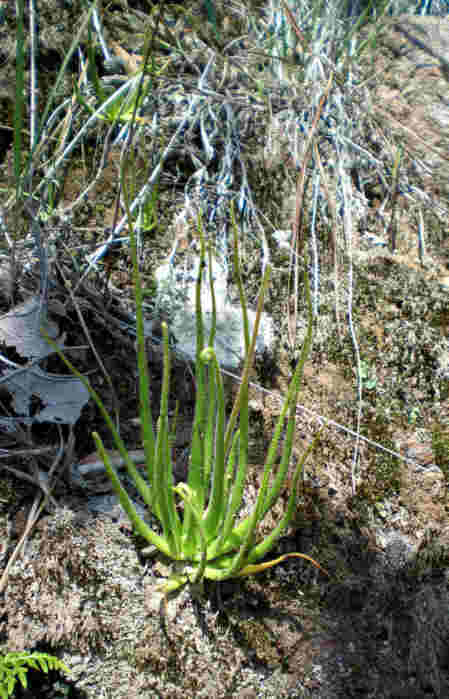 The apexes of the young scapes were curved downwards as with U.petersoniae, which Ruben & I had seen nearby 2 months before. 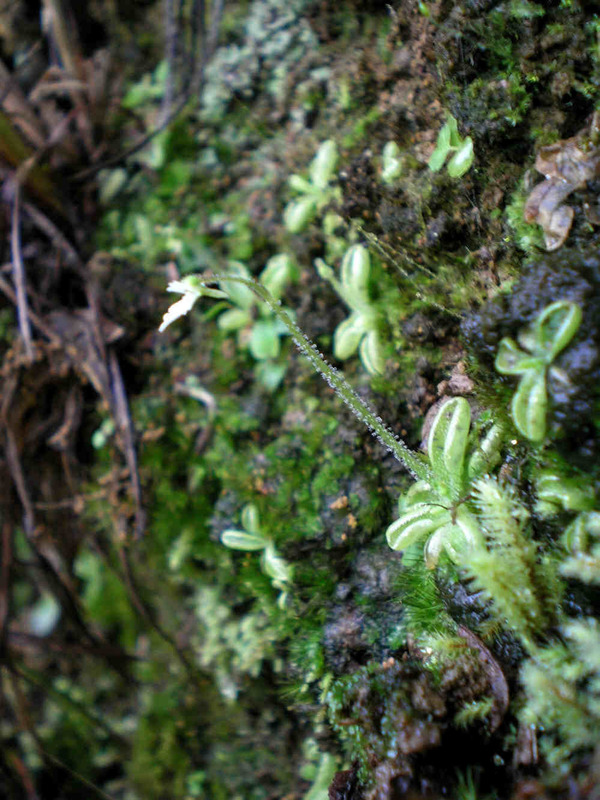 I got the clear impression that U.hintonii & U.petersoniae were very closely related. 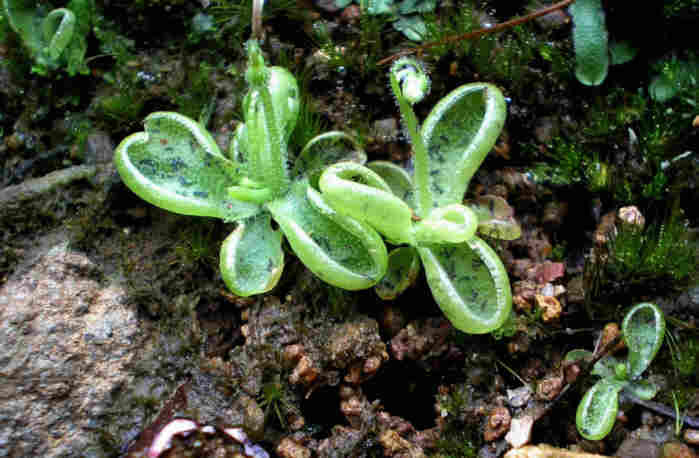 Only a few scapes were found in fruit, but these were not curved inwards as described by Taylor. Maybe they were still too young. The corolla lobes were also not found to be open as depicted by Taylor, but curved slightly inwards. The habitat of U. hintonii near Tejupilco. The habitat of U. hintonii growing near the river. 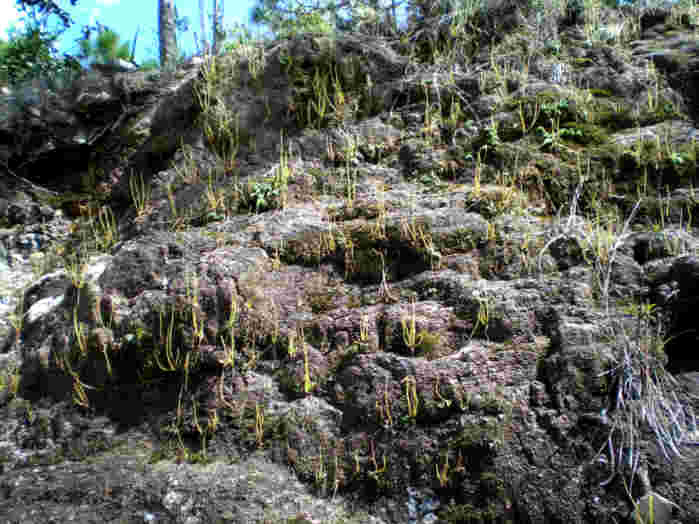 U. hintonii growing in wet mossy islands of vegetation among the rocks ! 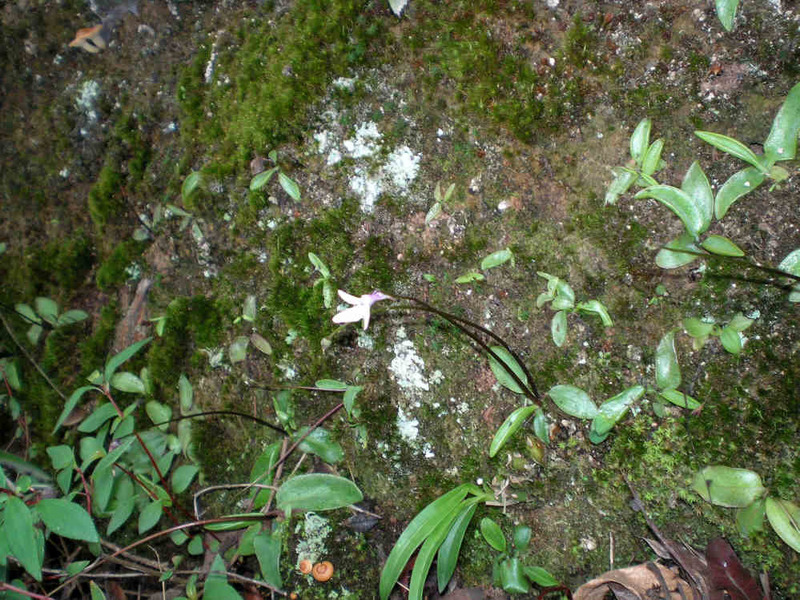 U. hintonii flowering in habitat. U. hintonii in wet moss among the rocks. 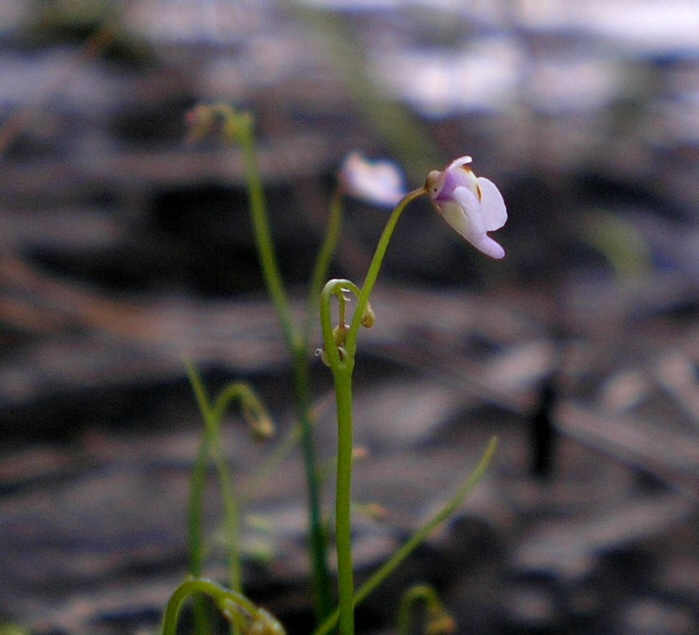 U. hintonii flower : mostly lilac with white on the palate around the two mustard spots on the lower lip.